Chan is an ancient Maya farming community in Belize, Central America. For 2,000 years, between 800 B.C .and A.D. 1200, Chan’s hilly terrain drew the attention of ancient farmers who developed a community, constructed a small ceremonial center, and farmed using complex and sustainable systems of terrace agriculture. During this time, the great lowland Maya cities of Tikal, Copan, Calakmul, Palenque, and many others, rose, flourished, and fell; in Europe, the Roman Empire rose and fell and prehistory gave way to the Middle Ages. Through all of this, Chan and its farmers thrived. Learn about the Chan project and its funding. 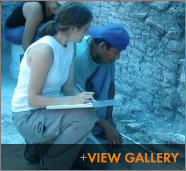 Access our publications, including books, dissertations, and field reports. Meet Chan’s international multidisciplinary research team.